The Cuilleron family has been active in the Northern Rhone valley making wine since early 1920’s, mostly in the Condrieu and St. Joseph appellations. That is where Yves Cuilleron developed his passion for wine. The domaine is located in Verlieu. Yves Cuilleron studied winemaking in Burgundy before embarking on a career in wine which began in in 1987. His first efforts on his own as a vigneron began in the Condrieu appellation. By 1993 he expanded his holdings to include owning vines in Cote Rotie. Domaine Yves Cuilleron owns 52 hectares of vines in total. 22 hectares of vines are located in Condrieu, where he produces La Petite Cote, Les Chaillets and Ayguets. He also produces Cornas, red and white wine in St. Joseph, St. Peray and several Vin de France wines. In the Cote Rotie appellation. Yves Cuilleron owns vines planted in the Bassenon, Rochains, La Landonne, Rozier, Vialliere, Mornachon, Le Plomb, Bonniviere, Janet, Grand Taillis and Gerine lieux dits. Many of the vines are young, having been planted starting in the 1990’s, going forward. Although, they own a small parcel of vines that were planted in 1965, that are placed in Terres Sombres. Domaine Yves Cuilleron Bassenon comes from vines planted in Coteaux de Semons. The wine made its debut in 1994. The wine takes its name from a small, local stream. The terroir is granite and gneiss soils. The wine is a blend of 90% Syrah and 10% Viognier. Some of the stems are removed. Vinification takes place in open top, oak fermenters. Malolactic fermentation takes place in tank. The wine is aged in an average of 50% new, French oak barrels for 18-20 months. The production is close to 750 cases per vintage. Domaine Yves Cuilleron Terres Sombres is the wine they have been making the longest. The wine is produced from vines planted in the Rochains, Rozier and Vialliere lieux-dits. The wine takes its name from the color of the soils where the vines are planted. Produced from 100% Syrah, the grapes are partially destemmed. The wine is vinified in open top, oak fermenters. Malolactic fermentation takes place in tank. The wine is aged in 60% new, French oak barrels for 18-20 months before bottling. On average, the annual production is close to 750 cases per year. Domaine Yves Cuilleron Madiniere was first produced with the 1994 vintage. The wine takes its name from a small stream located close to the vineyard. The terror is mostly schist soils on a steep hillside. The wine is produced from 100% Syrah and is Vinified in open top, oak fermenters. The wine is then aged in 50% new, French oak barrels for 18 months before bottling. The production is close to 1,250 cases per year. During the early to mid 1990’s Yves Cuilleron made his debut with a standard or traditional Cote Rotie. That wine is no longer in production. Domaine Yves Cuilleron, when young, should be decanted at least 1-2 hours, give or take, allowing the wines to soften and open their perfume. Older vintages might need very little decanting, just enough to remove the sediment. 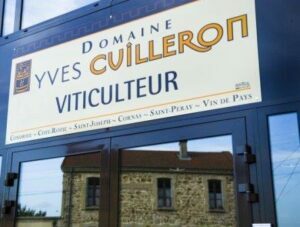 Domaine Yves Cuilleron is usually better with 6-9 years of cellaring and should be at its best between 8-18 years of age. Domaine Yves Cuilleron is best served at 15.5 degrees Celsius, 60 degrees Fahrenheit. The cool, almost cellar temperature gives the wine more freshness and lift. Domaine Yves Cuilleron is best served with all types of classic meat dishes, veal, pork, beef, lamb, duck, game, roast chicken, roasted, braised and grilled dishes. Domaine Yves Cuilleron is also good with Asian dishes, hearty fish courses like tuna, mushrooms and pasta. Condrieu, the white wine of Domaine Yves Cuilleron is best served with a myriad of different seafood dishes, shellfish, crab, lobster, sushi, sashimi, chicken, pork and veal, as well as Asian cuisine. Flowers, green olives, ripe red, crisp fruits and thyme aromas stand out here. The wine has lift, freshness and finishes with elegantly textured red plums and black pepper. From 100% Syrah, you find flowers, black raspberries, thyme, espresso and smoke. Full bodied, round, fresh and young, give this 3-5 more years in the cellar. Freshness, purity of fruit and an intriguing complication of earth, black pepper, flowers and stone, with polished tannins and a crisp, long, bright, red berry finish. Silky, round and floral, with blast of fresh, zippy, ripe, sweet black raspberries, kirsch, wet earth, pepper and bacon fat. This is drinking in the sweet spot today.